From a young age, I recall my father telling my sister & I, all my friends and their parents and any other human that we made contact with, that all you had to do was kick your foot in the sand and you would unearth a piece of pottery. He was right. The island’s rich history awaits man on all levels, weather it is in glass case holding Ajax’s horse, or the Castle walls of Famagusta designed by Leonardo da Vinci where Othello’s tower can be found, wherever one looked, history seeped and ran in torrents. One of our first adventures took us to Alasia/ Tuzla in Famagusta, where a Bronze Age settlement still lies. The settlement dates back to 1650-1050 BC. We drove through the gates where a small brick building lay from which we were to purchase our tickets to enter the settlement, after parking the car under the shade of a lone tree, my father explained that he had brought his children to teach them the history of the Island that he is so very proud of. The sweet elderly men in the office looked over to us, smiled and gave our father a nod; money would not be wanted, and tickets were not needed, just respect and knowledge in exchange. We proceed on foot, with our back packs carrying luke- warm water, sun block, cameras and the trusty book on Cyprus that father had for many years, the bags caused fantastic sweat patches upon our backs, but we were happy with our hats on our heads and thankful for our feet not tiring as we continued. Grabbing large sticks, we beat gently tapped the ground to ward of any snakes or reptiles that may be lingering, one can not be too careful. Alasia, as seen in the picture I took above, and everywhere else we had visited, to my sister and my bewilderment were not tapered off by wires and barriers; the site was open to us too walk and look into anywhere we wished. This freedom was exciting as we walked along old crumbling steps and peered into urns where bones may be found; the only point we had any reservations over such freedom was when we came across the settlement’s palace’s well which was rather deep and terrifying to peer into. One could see remnants of the straight streets which once cut into each other at right angles. 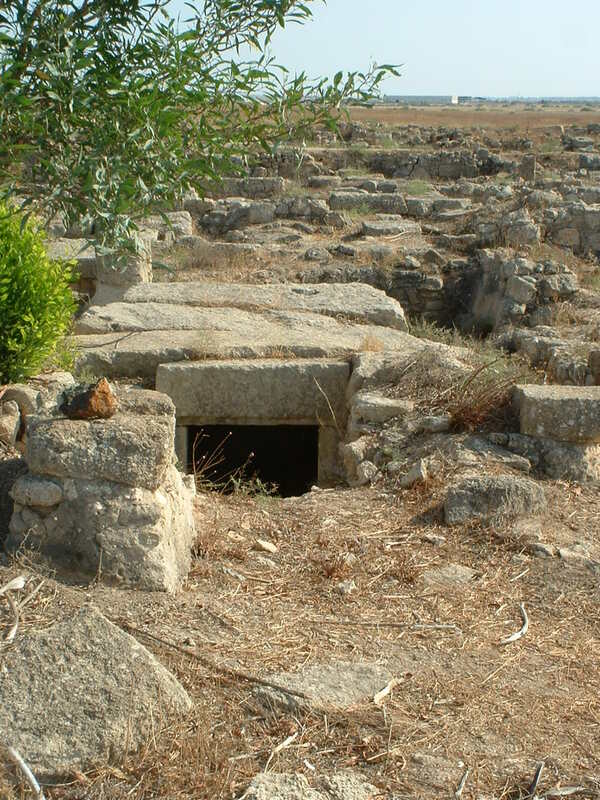 During expeditions carried out by the British in 1896, gold, ivory and painted pottery and tombs were discovered to belong to the Mycenaean period which later led to being referred to as the ‘richest Mycenaean cemetery in Cyprus.’ As we climbed and treaded carefully in the heat, the excitement was incredible, we bent over, looking deep into the ground, tracing the lives that had once inhabited the land. We could not comprehend how much more we had to learn. It was as though the earth was trying desperately to communicate with us, and it did. It continuously shared with us what had once been, never seizing to amaze us.